This is part 2 of a 9-part series that will look at selected areas of interest to Municipalities, pertaining to IT Budget Planning. Please contact me if you would like copies of other articles. It’s not hard to understand why. It has the least payoff in terms of cost-benefit of any function or system, or at least that’s the conventional wisdom. For every $100 you invest in BDR, you get exactly ZERO in increased functionality, capacity, and performance. In fact, it’s viewed as a drag on your IT operations, as it takes careful management and constant testing to ensure it’s working properly. Until you need it, then it’s like GOLD. At least one Alberta Municipality has learned this painful lesson every year for the last 5. You need to have an Insurance mindset to appreciate and properly plan for BDR. Backup is the process of taking your critical IT systems and copying them to a media that is removed from the main system using portable cartridges or by storing them to an offsite location. Backups are used to recover select data (such as files or Emails), to archive old seldom-used data, and for Disaster Recovery. Backup media can also be Cloud-based, in that backups are written directly to a Cloud Storage Provider. However, good Cloud systems copy data to a local storage device and then to the Cloud. Backup Retention is the term used to define how many days you can go back in time, before the backup media is overwritten with fresh data. Retention times can be a week, a month, or even a year. Longer retention times take more space on the media. Backup Software is the application that controls the process of copying the IT system data to the backup media. Modern software has sophisticated features that expedite, compress, and manage the backup process. Backup software also works in reverse, in that it manages the process of recovering files from the backup media to be put back on the server. Most modern backup software is subscription-based; you pay a monthly fee to use the software, instead of purchasing it outright. 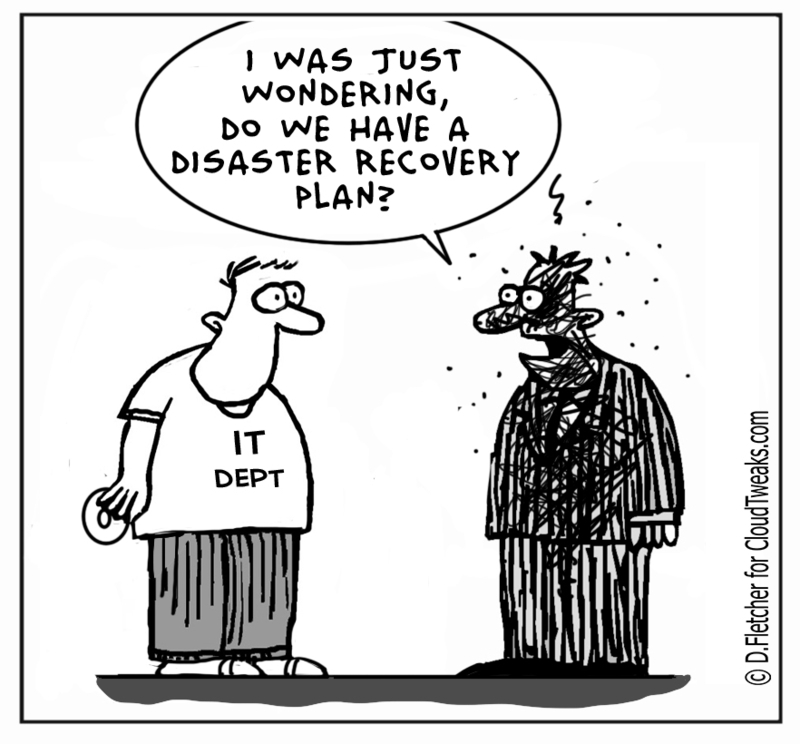 Disaster Recovery (DR) is the execution of a plan that outlines how backups will be used to recover systems in the event of a failure; often catastrophic or system-wide. We tend to think in terms of fire and flood, but Cyber Ransomware Attacks have caught out more than one Municipality in the last 18 months. The plan often provisions resources (servers, network infrastructure, Internet, etc. ), so DR often involves discussions about computer equipment. DR plans need to answer one fundamental question: How long can you be without one or more IT systems? The answer could range from several days to hours. Some mission-critical systems (like banks and hospitals) are measured in minutes or are even fully redundant (i.e. : they never go down.) Obviously, the shorter the allowable downtime, the more DR costs. Books have been written about the nuances of BDR, but we’ll focus on these simple definitions to help with our budget work. The simplest approach is to use a cartridge-based system with provision to store the 2nd oldest cartridge securely offsite (i.e. : bank vault); the CFO’s desk drawer, the Receptionist’s purse, or the filing cabinet are NOT secure and offsite. Thus, someone needs to make a trip to the bank’s safety deposit box every day. This uses a Cloud-based backup Provider to transfer the files DIRECTLY to the Cloud system. Cloud backup systems require high speed Internet; cable speeds (50/10 Mbps) or better. There are some caveats; national Cloud Providers often store redundant copies of backups in locales other than Canada, so this may violate legislative requirements. Recovery capabilities may be compromised; many national Cloud Suppliers have trouble transferring entire backup copies BACK to your hardware, in the event of a full restoration. Sometimes they revert to shipping portable hard drives back and forth across the country; hardly fast or secure. Cloud Providers usually supply their own backup software, and they should monitor backups, perform random restore tests, and troubleshoot backup errors, as part of their service… though you need to verify this. So, for an extra $4,050/year, you get the convenience of not having to manage Cartridge Security or rotation – or physically transfer cartridges. The retention period has been extended to 14 days, and you have TRUE offsite backup that is located at a significant distance from your facilities. However, meeting the 48 hour DR time-frame can still be a challenge; in fact, it may be worse – as to perform a full DR requires that you transfer upwards of 2 TB of data back over the Internet to your local facility – and you still have to find suitable equipment to host the restored files! This uses a Cloud-based backup Provider to transfer the files DIRECTLY to the Cloud system – AND the Cloud Provider is offering to remote-host your backed-up servers on their infrastructure, in the event of a Disaster. This means that your servers can be activated on the Cloud Supplier’s system, that would allow Users to login remotely to conduct operations. While there are some limitations, it means that DR times can be reduced to 24 hours or less – in some cases, as short as 8 hours. You also don’t need local server infrastructure to be operational in DR mode. So, for a little more than double the cost of Option #1, the BDR capabilities have been greatly enhanced. Of course, many factors will impact the budget for your individual BDR scenario: number of servers, amount of data, allowable down time, and Internet speed, are a few. The locally-managed solution (Option #1 – or a variation of it) is the only practical backup method, if you have poor Internet. Finally, a caution about Cyber Security (Little Idea #3): An effective BDR is the ONLY proven method to guard against a Cyber Ransomware Attack. While Firewalls, Anti-Virus, and User Training are good Cyber Security countermeasures, BDR is your last line of defense against an attack. When all else fails, you can wipe the servers clean and restore the last known (good) backups – but only if you have them. Next week, we’ll explore Proactive Maintenance. Until then, please contact me or your Account Manager, if you would like some personalized help with some stress-free BDR budgeting. * – Full Disclosure: We’re going to use equipment and prices for TRINUS-supplied Systems & Services. Other Provider costs and equipment may vary.